My wife and I had a standing disagreement for the first year after moving into our house: she thought it was faster to turn at the stoplight; I thought it was quicker to get there the back way. It turns out we were both wrong – a middle route is nearly always the fastest way to reach our house from the west. Though I was proven wrong, I was still happy to have found a shortcut. Shortcuts on the keyboard can dramatically improve your productivity when using software. Knowing the shortcut keys for common commands reduces the ‘friction’ of having to select a certain button among dozens or digging through menus. Saving a few seconds a hundred times a day adds up, both in time saved and frustration avoided. Hit “Keyboard” at the bottom. You’re now in the “Customize Keyboard” dialog, where you can specify new shortcuts for any commands (including some that are not active and hint at features that never made it to prime time, e.g. Steel Beam Connection Design). Note that the ‘Shift’ key cannot be used alone nor can the ‘Escape’ key (which should be used for clearing the selection, but isn’t). Have any favorites I’ve left out? Let me know in the comments. This entry was posted in ETABS, software. Bookmark the permalink. Too bad you only posted this just before ETABS 2013 came out and took them all away. I also use shortcuts incessantly, but thankfully I’ve already largely transitioned to external (Autohotkey scripted) shortcuts. Less reliable, but more flexible. Oh, and I think you just transformed my (work) life with Excel tables. Keep up the great posts! Tim – thanks for the note and the encouragement. 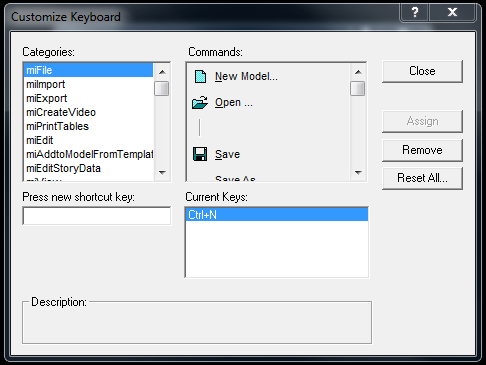 I’ve looked into Autohotkey in the past but never made the leap. Perhaps I should look at it again. 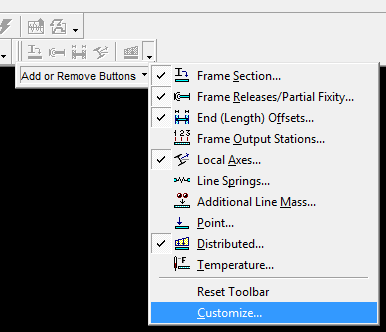 Yes, CSI has added custom keyboard shortcuts to ETABS 2013. The shortcuts are saved in an XML file which is easily modified outside of the user interface. One significant drawback: the commands accessible only on the toolbars (not via the menus) cannot be assigned to shortcuts. I’ve used AutoHotKey to work around this and replicate my ETABS 9 shortcuts. More on that in a future post. Can i have the any such file for ETABS 2016 or atleast the same. Can’t download from dropbox now.